When you find the perfect car, you get that warm, fuzzy feeling inside. You instantly know it’s the one as soon as you sit behind the wheel. As car enthusiasts, we have a sixth sense for these things. It just feels right. Sometimes, however, there’s a little something missing. Those two or three things that will complete the car. Never fear, they’re not missing. They’re just hiding in the optional extras package. For a petrolhead, it’s like being a child in a sweet shop. Browsing through the optional extras brochure gets us dizzy with excitement. We’re still a little delirious about our new car and we have a tendency to get carried away! Does this sound familiar to you? We’ve all been there when buying a new car and often we’ll drive away with extras we don’t necessarily need. It’s important to keep your cool when deciding on the extras for your new car. Although you may want everything, they’re not all worth their money. Some extras have a positive effect on your driving and safety. They’ll also help the car retain value when you come to sell it on. However, many optional extras are overpriced and hold no value at all. Some extras will even scare future buyers away. Choose carefully at this point. Here’s our list of the most valuable extras to invest in. These are small sensors that monitor your closeness to other vehicles when parking. It helps you avoid minor bumps at the supermarket and in those pesky parking towers. They’ll save you the hassle of little bumps and could even bring your insurance down. Parking sensors are also one of the best investments in terms of resale value. Here’s why. The optional extras that retain the most value are those that will eventually become standard. Think about which car features will be commonplace in all new cars five years down the line. For example, six years ago, the most valuable optional extra was power windows. It was clear that in six years, all new cars would come with them as standard. Any car without them would feel outdated, so selling it on would be tough. The same is true of parking sensors now. In five years, any car without them will feel outdated. The other factor to consider with optional extras is whether there’s an alternative. When it comes to air conditioning, there’s no reasonable alternative to staying cool. Other than winding the windows down, there’s simply no other way. For that reason, air conditioning is an attractive extra for second hand buyers. It’s still considered a luxury in many cars and it will never go out of fashion. Dealers, such as Inchcape Lexus, will offer air conditioning as an extra. We suggest you install this one. As car buyers we often wonder why a lick of paint should count as a paid extra. However, this one is worth the money. Although it adds no practical value to the car, it’s all about perception. A car with metallic car retains its shine for much longer. It gleams in the sunshine and appears newer than it really is. When it comes to selling your car on, this perception will add a little value. Moreover, many buyers love the look of metallic paint and will seek out used cars with that finish. Leather seats are a great extra for many reasons. First of all there’s the perception issue again. Leather trim appears more lavish than fabric interior. It holds its classy look for much longer than fabric too. When it comes to selling it on, you’ll hold a little extra value. For families with children, leather is a much more practical interior than fabrics. It doesn’t stain as easily and spillages wipe straight up. Families, trust us, leather is your interior of choice. Any optional extra that increases your resale market is a worthwhile extra. An automatic transmission can be added next to your traditional gear system. It won’t affect you too much while driving. But, when it comes to selling it on, you’ll give yourself many more options. Some people will only search out automatic transmissions. A few years ago, we’d have put satellite navigation systems at the top of our list. Nowadays, they aren’t holding quite so much value, but they’re still a worthwhile investment. With the increased capacity of navigation on smartphones, the inbuilt sat nav is less valuable. Having said that, it will still prove very useful to you as a driver. 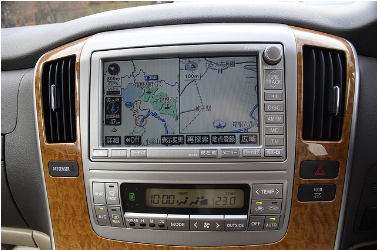 The built in navigation systems has many advantages over smartphones. Thanks to that, most drivers still trust them and will pay extra for them. We’ve grouped these two together because they’re not so common on the optional extras list. Instead, they are becoming standard issue on most new cars. If your new car doesn’t come with them as standard, then we suggest purchasing them without falter. Anti Lock Brakes are essential for maintaining control during evasive driving. They increase your safety while driving and should be considered essential. Without these two features, your car will feel very outdated in five years. It will make it a little more difficult to sell them on. Finally, we’ll end with some extras that you really shouldn’t be paying for. Essentially, these are personal taste extras. Things like rear spoilers, alloy wheels and custom paint jobs are a big no. While you may love them, you’ll narrow your resale market significantly and lose money. Even big stereo systems and DVD players can reduce the value as they go out of trend. Having said that, if you love them, who are we to stop you. It’s your car, after all! There you have it, a quick list of the good, bad and the ugly optional extras. Try and look to the future when deciding. What will become standard and what features will be valued? Finally, use the optional extras to improve your driving safety and practicality. Choose wisely!